Yesterday, Monica shared her experience at the Walk for Life in San Francisco, California. 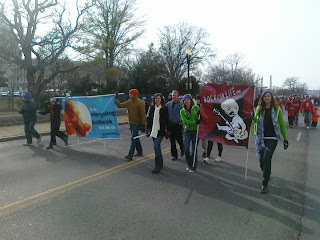 SecularProLife.org volunteers were also busy on the East Coast this past weekend, as a swarm of pro-life advocates converged upon Washington, D.C. for the March for Life. But we're getting a bit ahead of ourselves. First was the Students for Life of America conference, on Sunday. 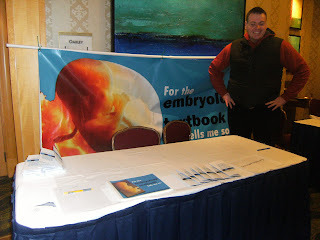 Kelsey, Phil, and Aimee ran the booth, where we distributed every last copy of our brochures and signs. 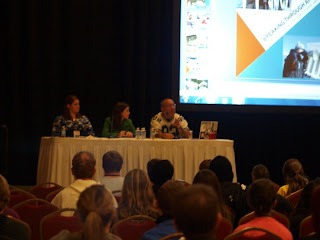 Kelsey (below, wearing green) spoke on a panel about breaking through the apathy on college campuses, with a focus on planning events that appeal to non-Christian students. The other members of the panel were Kortney Blythe of Students for Life, and Bryan Kemper of Stand True (who you might remember from this). The march started prematurely, but when I realized the cops weren't stopping it, we literally ran a few blocks and pulled in at the front, so that when the photographers at the top of Capitol Hill took their photos, it looked like WE were leading the march! 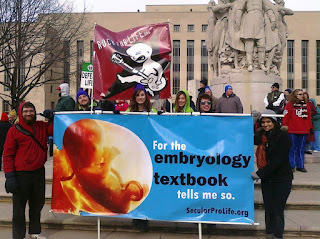 Later on, our "For the embryology textbook tells me so" banner was indeed captured by the news cameras. This is only our second year at the March for Life, and we got our message out loud and clear. None of this would have been possible without your generosity and support. Thank you! Another doc slips under the radar!